As we reach the finish of the New York Buyers’ Club fundraiser, we thought it was time to circulate the “Top Ten Reasons” to support NYBC–in case there are those of you out there who aren’t familiar with the unique contributions this nonprofit co-op and information exchange makes to the lives of people with HIV and/or Hepatitis C.
1. ThiolNAC. NYBC is the only source for this formula combining two widely recommended and well-researched antioxidants, alpha lipoic acid and NAC (N-acetylcysteine). ThiolNAC is especially useful for people with HIV and those with liver disease. NYBC’s combination formula reduces both cost and pill count. 2. NYBC stocks a unique lineup of high quality, specially formulated multivitamins, including Added Protection and Ultra Preventive Beta from Douglas Labs, and the Super Immune Multivitamin and Opti-Energy Easy Swallow from SuperNutrition, Member pricing for these multis is very low—in fact, Douglas asked us to hide the Member price from the general public! 5. PharmaNAC®. This effervescent, extremely stable form of NAC (N-acetylcysteine) supports respiratory and immune function. In particular, it holds promise for people with cystic fibrosis, according to recent clinical trials conducted at Stanford. NYBC has stocked an effervescent form of NAC since 2004, based on its well-supported usefulness for chronic conditions. 6. NYBC specializes in probiotics like Florastor® and Jarro-Dophilus EPS. Probiotics support gastrointestinal health, a foundation for general health. And, a recent review in the Journal of the American Medical Association found probiotics effective for preventing and treating antibiotic-related diarrhea, a common side effect. 7. NYBC monitors and presents to its Members the latest research on supplements to support cardiovascular health, including fish oil, CoQ10, plant sterols, and Vitamin D.
8. NYBC annual membership is a tremendous bargain at $5 (low-income, unemployed), $10 (middle-income), or $25 (higher income). Do you know of any other organization that offers annual memberships as low as $5, yet gives you such significant savings? 9. The NYBC Blog alphabetically indexes more than 400 informative posts, providing the latest research news about supplements in an easy-to-read online format. 10. Yes, you can talk to a live person at NYBC! Our Treatment Director, George Carter, has two decades of experience with supplement research, especially for people with HIV and/or liver disease. Reach him at our toll-free number 800-650-4983. By 2015, more than 50% of the United States HIV population will be over 50. There are approximately 120,750 people now living with HIV/AIDS in NYC; 43% are over age 50, 75% are over age 40. Over 30% are co-infected with hepatitis. What does the future hold for people with HIV and HIV/HCV as they get older? 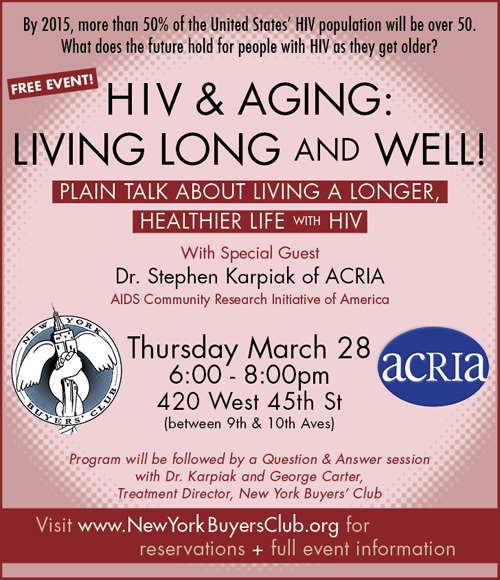 These statistics and this question furnished the starting point for the New York Buyers’ Club March 28 event HIV and Aging: Living Long and Living Well, presented by Stephen Karpiak, PhD, of the AIDS Community Research Initiative of America (ACRIA). Dr. Karpiak’s background uniquely positions him to paint the full picture behind the bare statistics, and to provide expert guidance through the complex healthcare challenges faced by the growing population of older people with HIV. After two decades as a researcher at Columbia University’s Medical School, Dr. Karpiak moved to Arizona, where he directed AIDS service organizations through the 1990s, including AIDS Project Arizona (which offered a supplements buyers’ club similar to NYBC’s). In 2002, back in NYC, he joined ACRIA as Assistant Director of Research, and was the lead investigator for the agency’s landmark 2006 study, Research on Older Adults with HIV. This report, the first in-depth look at the subject, surveyed 1,000 older HIV-positive New Yorkers on a host of issues, including health status, stigma, depression, social networks, spirituality, sexual behavior, and substance abuse. As Dr. Karpiak noted, HAART prevents the collapse of the immune system, and so it serves its main purpose, to preserve and extend life. And yet, as he reminded the audience, HIV infection initiates damaging inflammatory responses in the body that continue even when viral load is greatly suppressed. These inflammatory responses, together with side effects of the HIV meds, give rise to many health challenges as the years pass. In people with HIV on HAART, research over longer time periods has found higher than expected rates of cardiovascular disease, liver disease, kidney disease, bone loss (osteoporosis), some cancers, and neurological conditions like neuropathy. That brings us to “multi-morbidity management”—a term we weren’t enthused about at first, since it sounded more like medical-speak than the plain talk our NYBC event had promised. But Dr. Karpiak gave us a simple definition: dealing with three or more chronic conditions at the same time (and HIV counts as one). He then made the case that this is a critical concept to grasp if older people with HIV are going to get optimal care. Multi-morbidity management, he explained, is a well-accepted healthcare concept in geriatric medicine, which recognizes that older people may have several conditions and will benefit from a holistic approach in order to best manage their health. Treating one condition at a time, without reference to other co-existing conditions, often doesn’t work, and sometimes leads to disastrously conflicting treatments. And here’s where Dr. Karpiak warned about “polypharmacy”–another medical term worth knowing. “Polypharmacy” can be defined as using more than five drugs at a time. Frequently, it comes about when healthcare provider(s) add more and more pills to treat a number of conditions. But this approach can backfire, because, as a rule of thumb, for every medication added to a regimen, there’s a 10% increase in adverse reactions. That’s why adding more and more drugs to treat evolving conditions may be a poor approach to actually staying well. In closing, Dr. Karpiak focused especially on a finding from ACRIA’s 2006 study: the most prevalent condition for older people with HIV, aside from HIV itself, was depression. Over two-thirds of those surveyed had moderate to severe depression. Yet while depression can have serious conse-quences–such as threatening adherence to HIV meds–it has remained greatly under-treated. It may seem an obvious truth, but as Dr. Karpiak underlined, psychosocial needs and how they’re met will play a big role in the health of people with HIV as they age. What social and community supports are available becomes a big medical question, and how healthcare providers and service organizations respond to it can make for longer, healthier lives for people with HIV. And now we come back to NYBC’s contribution to the discussion on HIV and Aging. While NYBC doesn’t keep track of such information in a formal way, we do recognize that quite a few of our members have been using supplements since the days of our predecessor organization DAAIR–going back 20 years now. That’s a lot of accumulated knowledge about managing symptoms and side effects among people with HIV! To accompany the March 28 presentation, our Treatment Director George Carter drew up a pocket guide to complementary and alternative approaches: HIV and Aging – Managing and Navigating. Partly derived from his long experience, and partly drawn from a 2012 Canadian report, the guide ranges over those kinds of “co-morbidities” that Dr. Karpiak spoke of, including cardiovascular, liver, kidney, bone, and mental health conditions. Interventions or management strategies include supplements, but also diet and exercise recommendations, as well as psychosocial supports (counseling, support groups, meditation, and activism). NYBC has also updated several info sheets from its website and blog, offering these as a way to address some of the most common healthcare issues facing people with HIV as they get older: cardiovascular topics; :digestive health; NYBC’s MAC-Pack (a close equivalent to K-PAX®); key antioxidants NAC and ALA and their potential to counter inflammatory responses; and supplement alternatives to anti-anxiety prescription drugs. These info sheets, together with the HIV and Aging – Managing and Navigating pocket guide, are available on the NYBC website and blog. ThiolNAC (NYBC) Each bottle, 90 tablets, sustained release formula. Each tablet contains 500 mg of NAC and 134 mg of alpha lipoic acid. As part of the MAC Pack, three per day provide the equivalent dose as used in the original neuropathy study published in the journal AIDS: 1500 mg of NAC and 402 mg of alpha lipoic. This is an excellent formula for those suffering from liver inflammation. It is also extremely convenient for many PWHIVs who take both NAC and Lipoic Acid since this 2-in-1 combination eliminates some pills while providing the same, generally accepted dosages. Suggested use is 2-3 tablets daily with meal or as directed. Reduce dose if headaches occur. Note: This version of NYBC’s ThiolNAC intentionally decreases the alpha lipoic acid amounts per tablet from our original formula’s 200mg/tab to the present formula’s 134mg/tab. This change brings us precisely in line with the dosage studied in Jon Kaiser’s study, and also responds to a concern raised by our colleague Lark Lands regarding higher dose alpha lipoic and hypothyroidism. NAC (N-acetylcysteine) has long been used for chronic bronchitis. A study published in 2000, for example, surveyed 9 well-designed trials of NAC for broncopulmonary conditions and found evidence that “a prolonged course of oral NAC prevents acute exacerbations of chronic bronchitis” –meaning improved quality of daily life for patients. Reference: Grandjean, et al. Clin Ther. 2000 Feb;22(2):209-21. Efficacy of oral long-term N-acetylcysteine in chronic bronchopulmonary disease: a meta-analysis of published double-blind, placebo-controlled clinical trials. Clin Ther. 2000 Feb;22(2):209-21. We were glad to see a recent Q&A on the “Ask the Experts” forum of thebody.com, which is one of the leading online sources of information for people with HIV. The question concerned NYBC’s MAC-Pack, our low-cost, close equivalent to K-PAX, a multivitamin/antioxidant combination which has been shown in research to raise CD4 counts, and which is available thru some — but not all–formularies in some — but not all — states. Supplement quality is always an important issue. One available resource is http://www.consumerlab.com although they are a for-profit company. It would be preferable if there were a government agency that routinely tested supplements and published the results! It will always be a bit of a crapshoot, but the good news is the majority of supplements tested by them either pass and those that do fail often do for relatively minor reasons (though some do spectacularly). According to Jared Becker and George Carter from the New York Buyers Club, the brands used in NYBC’s MAC Pack come from companies as reputable as K-PAX and with longer histories. NYBC has assessed Jarrow, Douglas Labs and Montiff, the providers used to make the Mac Pack. A few years ago, NYBC sent Montiff’s acetylcarnitine for testing and it came back fine. NYBC also uses consumerlab’s reports to verify quality of our big suppliers like Jarrow and Douglas.